The most common complaint on potted bougainvillea is that they stop flowering shortly after the plant they buy it from the nursery. It is so frustrating to see that the plant which was full of bright and attractive blossoms in the nursery has become dull. So how to keep bougainvillea blooming all year round? Most bougainvilleas bloom almost all year round if grown outdoors, specifically from spring through summer, if given the right growing conditions and care. In cooler climates, they will bloom for only a limited time in summer. No Flowers on bougainvillea? Why does bougainvillea not bloom? Why your bougainvillea not blooming? What has gone wrong? Learn how to how to keep bougainvillea blooming or how to force your potted bougainvilleas to bloom by taking proper care of light, watering, fertilizing, pruning and re-potting. There are ways to force potted bougainvilleas or grown in ground to bloom by taking proper care of light, watering, fertilizing, pruning and re-potting. The flowering of bougainvilleas depend on the amount of light the plants receive. If growing in shade, they will produce plenty of good dark green leaves, but they will not bloom. Put the bougainvillea plant in direct sun for at least eight hours daily for them to bloom their best. Cover the Bougainvillea plant with a blanket to protect it from frost, otherwise it can be damaged or killed. Place an indoor Bougainvillea plant in the brightest area of the house during winter - a south-facing window, and move it outside for the summer. To force bougainvillea into bloom, nurseries often withhold water for a few months. Then they water the plant heavily. The plant which was thinking that it was dying due to drought, will now think it has one last chance to propagate itself, so it blooms heavily to produce seeds. This is the best trick to bloom your bougainvilleas. 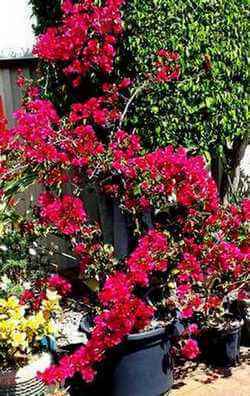 Bougainvillea are very drought-tolerant and thrive on neglect. So do not over-water the plant. Only water them when the leaves are withering. If growing in ground, you do not need to water them frequently once they are established. A little wilting can be used to encourage a reluctant bloomer to flower. When little colorful flower buds start to appear, water more frequently. Never allow a bougainvillea plant in bloom to wilt severely, as this will greatly shorten the blooming time. Too much frequent nitrogen fertilizer encourages a bougainvillea plant to grow lots of vegetative parts like leaves and stems at the expense of buds. Only a new plant needs a higher nitrogen fertilizer to help encourage good growth. Use a high-potash fertilizer, such as a hibiscus or tomato fertilizer during spring and summer. I feed my plants with a liquid feed high in potassium every 3-4 weeks. If the plant starts growing vigorously with big green leaves, then cut back on fertilizer. A tablespoon of Epsom salt can help. If nothing works, giving a dose of bone meals or super phosphate would produce new flowers in about 3 weeks. Bougainvilleas bloom much better when the roots have become pot-bound or slightly crowded in the pot. Repot into a bigger pot ONLY when the health of the plant begins to suffer, otherwise shifting them into larger pots will encourage a large plant without blooms. I leave bougainvilleas in the same pots for many years. If you want to grow bougainvillea in ground, plant it in a pot and bury in the ground for root binding. Proper pruning is important for bougainvillea to bloom. Bougainvillea pruning encourages new growth and blooms., pruning overgrown bougainvillea is actually a bloom booster. Pinch off about 1/2 inch of the stem tips and prune plants in early spring to encourage more flowers. When blooms finish for the season, cut it back by a few inches to force blooming. Heavy pruning will reduce the amount of blooms. Prune any suckers grown at the base of the plant to encourage more growth at the top. As the plant matures, flowering will increase both in amount and duration. An older bougainvillea in a pot or ground will bloom more on and off for several months.